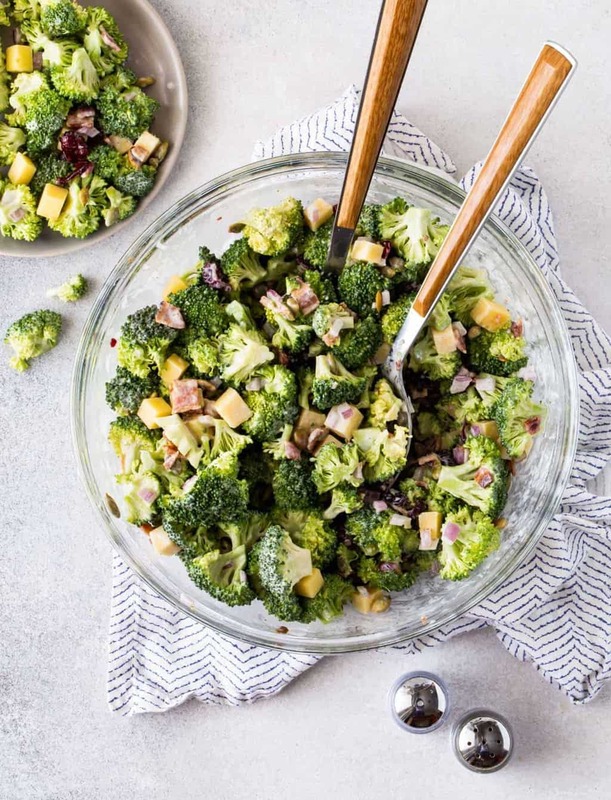 No BBQ is complete with tasty side dishes, and this delicious Easy Broccoli Salad with Bacon and Cheese recipe deserves a spot at every cookout you attend this summer. What is summer without broccoli salad? Spotting a broccoli salad recipe at a summer BBQ is almost as common as spying potato salad. Sure, you can buy a version at the grocery store deli, but this Easy Broccoli Salad with Bacon and Cheese is so tasty and simple (plus a tiny bit healthier with the addition of Greek yogurt), you’ll never go back to store-bought broccoli salad again. What do you put in a Broccoli Salad Recipe? 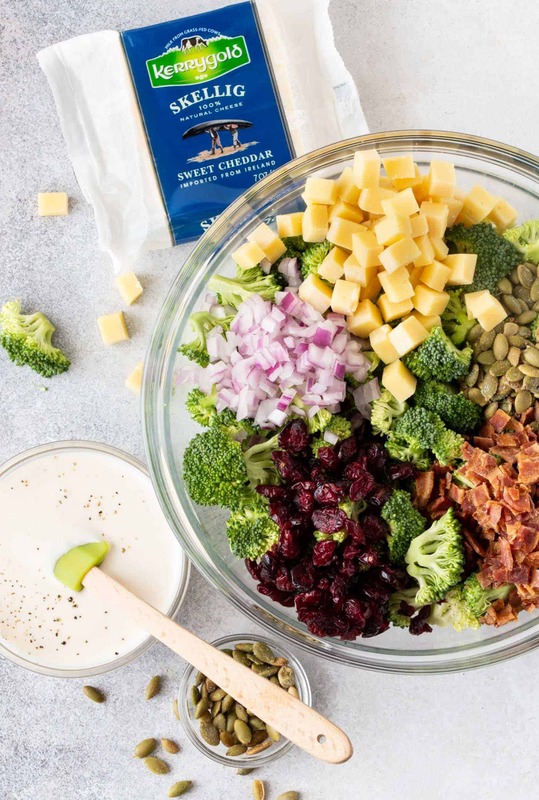 Our Easy Broccoli Salad with Bacon and Cheese ups the ante in a delicious way with the addition of crunchy bacon, sweet craisins, salty pumpkin seeds and rich and tangy Kerrygold Skellig Sweet Cheddar Cheese. A lot of dressings for broccoli salad are the same: mayonnaise, sugar and vinegar. Our dressing uses Greek yogurt to replace some of the mayonnaise and includes only a modest tablespoon of honey. The result is still creamy and rich but not quite as heavy or sweet. As a result, the flavors of the individual ingredients really shine through. 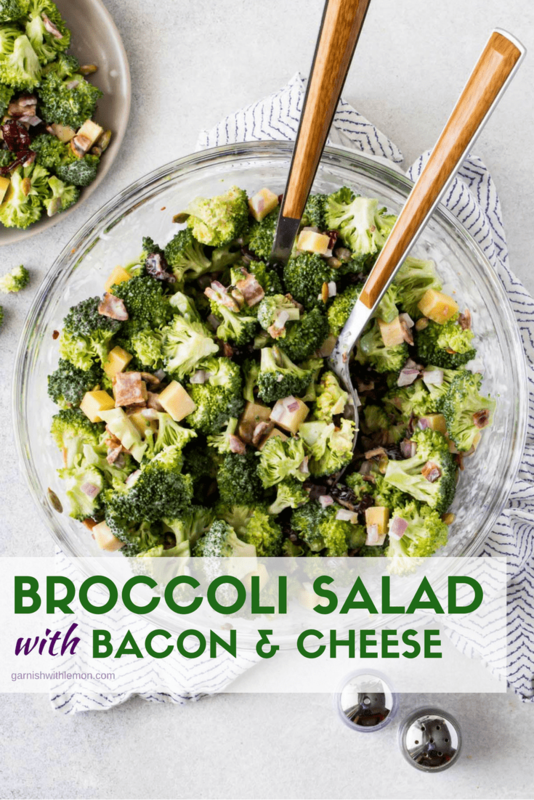 Do you have to cook the broccoli for this Easy Broccoli Salad with Bacon and Cheese? No, but you do need to refrigerate the salad for at least an hour to allow the flavors to meld together. The broccoli will naturally start to soften after mixing with the salad dressing. Love this broccoli salad recipe? Check out some other easy side dishes for your summer BBQs! This Bacon and Ranch Pasta Salad is a great make ahead option for potlucks. This Broccoli Slaw Salad is a fun twist on a traditional broccoli salad. No mayo required with this Easy Orzo and Chickpea Salad! Love the addition of crunchy ramen in this Ramen Broccoli and Kale Salad. Not a broccoli fan? Try this Shaved Brussels Sprouts Salad with Citrus Vinaigrette instead. Disclosure: This post was sponsored by Kerrygold. We only share products with you that we personally use and love. Thanks for supporting the brands that make Garnish with Lemon possible. Whisk together mayonnaise, yogurt, vinegar and honey and season to taste with salt & pepper. Set aside. Combine broccoli, onion, bacon, cheese, craisins and pepitas in a large bowl. Stir in dressing until thoroughly incorporated. Cover and refrigerate for at least one hour. Serve cold.